I’ve been asked to speak for the Pink Dragon Ladies of Team Survivor Tampa Bay. I KNOW I’m not their first choice. That would have been Carol Lee. When we needed someone with poise, enthusiasm, knowledge, and a good sense of humor to speak in public – Carol Lee got pushed to the front—literally! But with a little help from my notes, I hope I can make her proud of me today. I can’t talk about Carol Lee without talking about the Pink Dragon Ladies—the PDL’s or the Pinks as we are affectionately called! So, let me start by explaining what dragon boat racing is and who we are. Picture a canoe, 41 feet long and four feet wide, with ten narrow benches, the head of a dragon on the bow and a tail on the stern. Now, picture 20 people sitting two abreast on those benches, paddling furiously and forcefully, in unison, for 500 yards. Being “bitten by the dragon” means different things to different survivors. Some join because they want to get physically fit again or for the first time. Some join because the team members look like they’re having so much fun. Some join because being part of the group empowers them in the face of cancer. Some join to show the world that, even after cancer, they can be strong and life can be even better than before. And after they join, they stay because of the special bonds they form with each other and the team as a whole. The PDL’s are the first survivor dragon boat team in Florida, and as such, we have been trailblazers, poster children, role models, and cheerleaders for other survivor groups including a new sister dragon boat team in Miami. Those of you who know Carol Lee well can see why it was inevitable that Carol Lee would be bitten by the dragon! I could tell Carol Lee was a woman who was confident, driven, and KNEW what she wanted. We didn’t need to empower Carol Lee—nobody needed to EMPOWER Carol Lee! But Carol Lee needed a vehicle through which she could channel her energy, anger, frustration, courage and strength to fight back against the cancer that had the AUDACITY to invade her body. The Pink Dragon Ladies fit the bill. I liked Carol Lee right away! 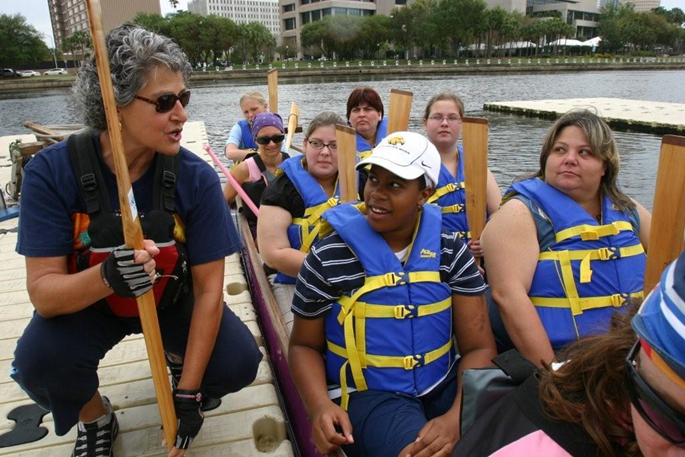 She took to dragon boat racing with a passion. She approached it like everything else she chose to do—she did it RIGHT and she did it WELL. And when I learned that we were born in the same year, I knew why I liked her so much – because she too, was born in the Chinese Year of the Dragon. And like a true Dragon Lady, Carol Lee exhibited the quintessential “dragon” characteristics. She inspired confidence and trust. She was honest, sensitive, brave, energetic, and, yes, stubborn! Carol Lee was a no-nonsense gal. The first chance she got, she went to a week-long dragon boat training camp. She didn’t just take the paddling classes, she also took the coaching classes and came back prepared to share her knowledge with the rest of the team. Carol Lee soon became one of our strongest and most skillful paddlers earning her a venerable seat in what we call “the engine room.” She was a role model for new and old members. But that wasn’t enough for Carol Lee! Let me bring you back to that mental image – 20 paddlers in a skinny canoe – now picture a dragon boat race. In addition to those 20 paddlers, you’ve got a drum and drummer sitting precariously on the front deck and a person standing on a narrow, triangular rear deck with a long oar steering the boat down one of five, 10-foot wide lanes, with four other raucous boats trying feverishly to beat YOU to the finish line. Don’t forget the beating drums and the screaming crowds. By now, with all hands on deck, this vessel weighs about a ton and a half. And it’s probably facing cross currents and a stiff wind – maybe even some waves. The person steering the boat has to consider: the weight and power balance of the paddlers; he strength and direction of the wind, waves, and current; the impact of the wakes of other boats; and the skill and temperament of the team —calculating and adjusting constantly under the critical gaze of thousands of spectators. Why would anyone WANT to do this?… No one had to ask Carol Lee this question when she volunteered to steer our boat. It was just so Carol Lee! She was the first PDL to volunteer to steer, and to date, she is still the only PDL who has steered the boat during a race festival. But that was Carol Lee. When it became apparent that the PDL’s needed to get their public relations and fund raising act together, it was Carol Lee who stepped up to be become our first Chairwoman. She led by example. It was Carol Lee who found and obtained our first grant. It was Carol Lee who launched the cell phone recycling project. And even after her cancer came back, it was Carol Lee who ran around to the Harley Davidson shops soliciting donated gifts for our first, annual Motorcycle Poker Run. And Carol Lee knew that you can’t do fundraising without friendraising. So she launched the PDL’s “Dragon Scouts” project. We have now introduced over 40 local Girl Scouts and their leaders to dragon boat racing and they returned the favor by attending the Tampa races, cheering us on, and spreading the word about our cause. Carol Lee was the face of the PDL’s—she was the “rock” that unflappable, clear-thinking, stabilizing force behind the leadership of the PDL’s. When our enthusiasm exceeded our resources, when our opinions started crashing into one another, when we hit a slump in creativity, or when no one was willing to take the helm Carol Lee was there to get us back on course—both literally and figuratively. This will take place during our commemorative flower ceremony at the Tampa Bay Dragon Boat Race festival on May 2, 2009. And, thanks to Dr. Kathryn Kepes, a local radiation oncologist, at that race festival we will inaugurate the Carol Lee Cup, the trophy that will be presented to the winners of the Cancer Survivor Division. We hope that Ed and Shanna will be able to participate in these memorial activities with us, and we invite all of you to join us as well. Carol Lee’s memory will also live on through the “Carol Lee Banks Fund” that Ed and Shanna have asked us to establish through our 501 (c)3 corporation, Team Survivor Tampa Bay. We have already received generous donations from some of you, and we will continue to grow the fund to support the dragon boat activities that Carol Lee loved and inspired. In closing and on a personal note, Carol Lee was a dear friend who was always there when I needed her—to solve a problem, participate in a project, or share a laugh. And I have to believe that she is still there and will always be. I miss her terribly, but I keep her in my heart and I see her Mona Lisa smile whenever I think of her.